A “no non-sense”, well written “go to” guide pertaining to the basic fundamentals of parenthood comes your way! 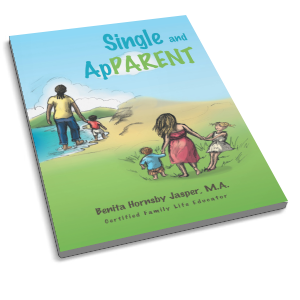 Author and proud single mother Benita Jasper offers an excellent resource tool not only for expectant or new parents, but in particular, professionals working in the field of social work or family studies. Written in clear presentation and format, Single and ApPARENT, a trans-cultural self help book, is a must- read for any professional working with varied demographics, with an emphasis on young, new, or expecting parents. Disclaimer: All information and data provided on this site is for informational purposes only. The author makes no representations as to, completeness, accuracy, correctness, suitability, or validity of any information on this site and will not be liable for any errors, omissions, or delays in this information or any losses, injuries, or damages arising from its display or use. All information is provided on as need basis.